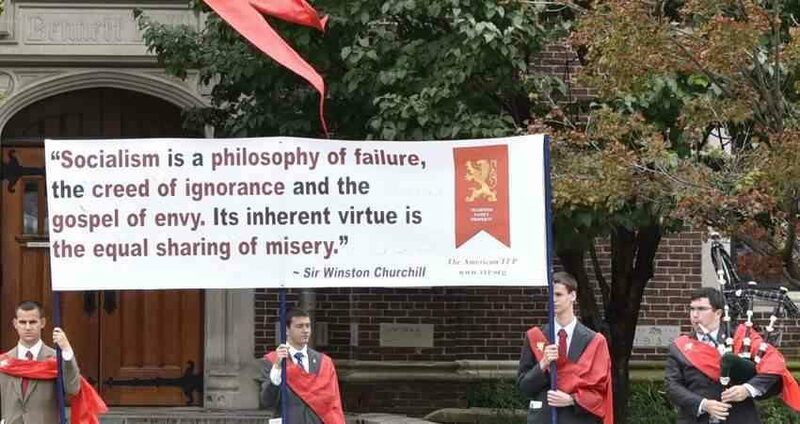 TFP volunteers display a quote by Churchill at UPenn. "Keep America Strong. Reject Socialism!" once again rang through the streets. The TFP was on the advance afresh, following the previous week's campaign against socialism at Gettysburg College. This time TFP Student Action volunteers traveled to the University of Pennsylvania in Philadelphia to tackle the same topic. Unlike Gettysburg College, no one attempted to eat the TFP flyer at UPenn. Rather, most of the discussions were positive or at least intellectual and civil. Many students thanked us, shook our hands, and expressed support. In particular, a Bulgarian lady expressed her gratitude because she said her family had "experienced the devastating results of socialism in Bulgaria" firsthand. "This is the best thing that ever happened on this campus," exclaimed one student who was delighted to receive the handout, "10 Reasons to Reject Socialism." A young woman, member of a pro-socialist club at the Ivy League campus, paused to ask why the teaching of the Catholic Church is incompatible with socialism. She mentioned that her two brothers had converted to the Catholic Church after studying Her teaching. By the end of the discussion, she expressed a desire to do more research about the Catholic Church's stance against socialism. A Chinese woman was surprised to learn that parents should be the primary educators of their children, not the State. After having lived in a communist regime, which routinely tramples parental rights, she never considered the vital and natural role of parents. Many similar discussions and debates took place into the afternoon at the intersection of Walnut and 34th Streets. "The world is unraveling and there is no solution," said one man with deep concern. "No political party is capable of turning things around." A TFP volunteer responded: "Yes, human solutions are shallow. But if we are open to the grace of God, there is a solution." Prof. Plinio Correa de Oliveira was more eloquent. He said, "When men resolve to cooperate with the grace of God, the marvels of history are worked: the conversion of the Roman Empire; the formation of the Middle Ages; the reconquest of Spain, starting from Covadonga; all the events that result from the great resurrection of soul of which peoples are also capable. These resurrections are invincible, because nothing can defeat a people that is virtuous and truly loves God." Encouraged by this latest campaign, TFP Student Action is looking forward to its next adventure for moral values.